On the 1st (Sat), take in panoramic vistas at Space Needle, then view the masterpieces at Chihuly Garden and Glass, and then explore and take pictures at Safeco Field. Keep things going the next day: examine the collection at The Museum of Flight, then meet the residents at Seattle Aquarium, then take in the exciting artwork at Glasshouse Studio, and finally wander the streets of Pike Place Market. To see traveler tips, reviews, photos, and more tourist information, go to the Seattle driving holiday tool . Salt Lake City to Seattle is an approximately 4.5-hour flight. You can also drive; or take a bus. You'll gain 1 hour traveling from Salt Lake City to Seattle due to the time zone difference. Expect slightly colder temperatures when traveling from Salt Lake City in June; daily highs in Seattle reach 74°F and lows reach 57°F. Wrap up your sightseeing on the 2nd (Sun) early enough to travel to Portland. 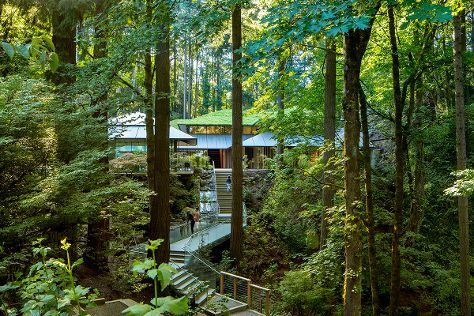 Start off your visit on the 3rd (Mon): steep yourself in history at Pittock Mansion, admire the natural beauty at Portland Japanese Garden, take in nature's colorful creations at International Rose Test Garden, then take in nature's colorful creations at Hoyt Arboretum, and finally admire the natural beauty at Lan Su Chinese Garden. Get ready for a full day of sightseeing on the next day: admire nature's wide array of creatures at Oregon Zoo, have fun and explore at Portland Children's Museum, then trek along Forest Park, and finally look for gifts at Powell's City of Books. To find reviews, ratings, traveler tips, and other tourist information, read Portland trip builder app . You can fly from Seattle to Portland in 3 hours. Alternatively, you can drive; or take a bus. In June, daytime highs in Portland are 77°F, while nighttime lows are 56°F. Wrap up your sightseeing on the 4th (Tue) to allow time to travel to Mount Shasta. Mount Shasta is a city in Siskiyou County, California, at about 3600ft above sea level on the flanks of Mount Shasta, a prominent northern California landmark. Start off your visit on the 5th (Wed): admire the sheer force of McCloud Falls, get curious at Mt. Shasta Sisson Museum, and then get impressive views of Mount Shasta. For maps, where to stay, other places to visit, and tourist information, use the Mount Shasta day trip planning site . Traveling by car from Portland to Mount Shasta takes 6 hours. Alternatively, you can fly. Traveling from Portland in June, Mount Shasta is slightly colder at night with lows of 50°F. Cap off your sightseeing on the 5th (Wed) early enough to travel to Solvang. Solvang is a city in Santa Barbara County, California. On the 6th (Thu), learn about winemaking at Sanford Winery & Vineyards, do a tasting at Alma Rosa Winery and Vineyards, then learn about winemaking at Rusack Vineyards, then do a tasting at Sunstone Vineyards & Winery, and finally take in the architecture and atmosphere at Bethania Lutheran Church. For where to stay, other places to visit, and tourist information, read Solvang trip builder website . Drive from Mount Shasta to Solvang in 8.5 hours. Alternatively, you can fly. June in Solvang sees daily highs of 83°F and lows of 50°F at night. Wrap up your sightseeing on the 6th (Thu) early enough to travel to Sequoia and Kings Canyon National Park. On the 7th (Fri), stroll through Moro Rock, then take a peaceful walk through Giant Forest, and then take a memorable drive along Generals Hwy. On your second day here, steep yourself in history at General Sherman Tree and then hike along Lakes Trail in Sequoia National Park. For traveler tips, maps, other places to visit, and more tourist information, use the Sequoia and Kings Canyon National Park travel itinerary planner . Getting from Solvang to Sequoia and Kings Canyon National Park by flight takes about 7 hours. Other options: do a combination of bus and shuttle; or take a bus. Prepare for a bit warmer weather when traveling from Solvang in June: high temperatures in Sequoia and Kings Canyon National Park hover around 94°F and lows are around 62°F. Cap off your sightseeing on the 8th (Sat) early enough to travel back home.